Large format wood look boards. Tired of taking care of that old wooden deck year after year? 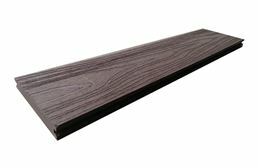 Stop all the fuss and invest in composite decking from RubberFlooringInc. 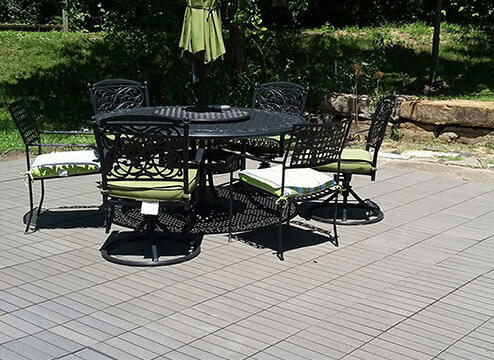 Composite deck tiles and boards are the perfect ‘DIY’ alternative to standard wood for your outdoor deck and patio. Made with recycled plastic and bamboo, our composite wood decking is durable and very ‘Eco-friendly’. Easy to install and maintenance free makes this decking great for anywhere in the country. Attracting no bugs, spend more time enjoying your new deck than working on it. Why Should I Choose Composite Decking? These products are specially designed to be used outdoors, and are built to withstand the tough love that Mother Nature has to offer. Made using recycled materials, composite decking is eco-friendly compared to traditional lumber decking options. 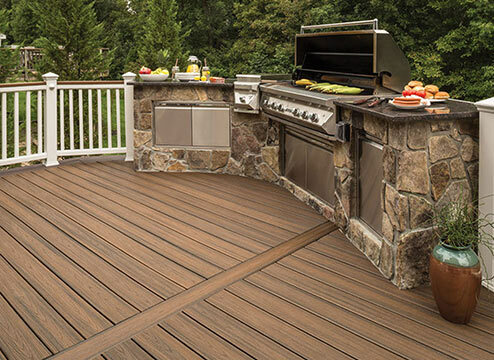 Composite deck flooring won't rot, and is manufactured to be more durable than real wood. 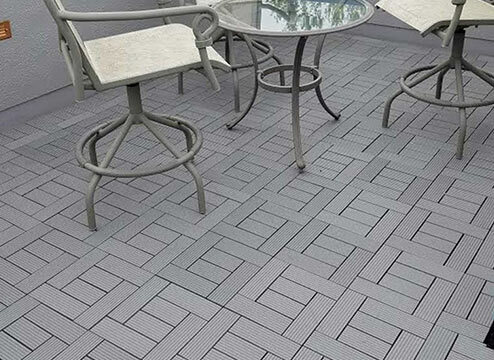 Composite decking boards and tiles are made to withstand the bright sun. They are fade resistant, as well as being stain resistant. 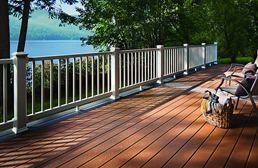 Composite decking doesn't need to be sanded, painted or sealed regularly like regular wood decks. Wood decks require hours of labor intensive maintenance. 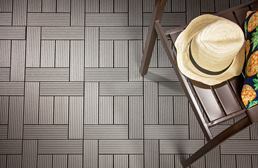 Tiles feature a user friendly interlocking system that goes together like a puzzle. Those little pesks don't stand a chance when it comes to composite decking. When it comes to insect lunch time, they'll move right along to an all natural prime beef wood deck option. 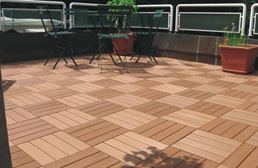 Lasts longer in the elements compared to traditional wood decking, and can be up to 2x the lifespan. This ends up being much cheaper in the long run, compared to natural decking. 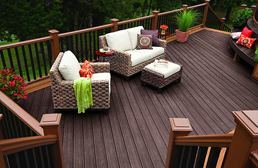 Composite decking is a man-made decking material made of equal parts recycled wood fibers and recycled plastic. 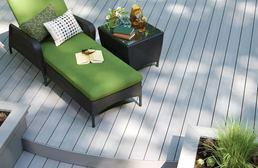 This alternative to natural wood decking is becoming the fastest-growing decking option on the market. So, what is it that homeowners love about this new trend? The ability to relax on a beautiful deck without the hassle of maintaining it. Durable and made to last, the best composite decking products simulate the beautiful appearance of natural wood without the maintenance and upkeep. Instead of logging hours building, staining or re-sanding your deck, you’ll actually have more time to relax and enjoy it! 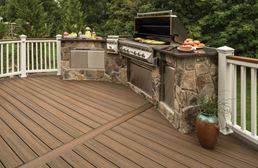 Less hard labor and more relaxation are among the best perks, but people are going with composite decking over natural wood for many reasons. Why Choose Composite Decking Over Wood? 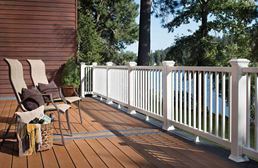 Easier to maintain: Composite wood decking products will not splinter or warp like natural wood planks do. The material is protected and essentially encased in a plastic barrier that helps prevent the growth of mold and mildew, so there’s no need to stain or finish the surface! Easier to clean: Wood is notorious for being high-maintenance. Expansion, contraction, termites, wood rot, re-sanding, refinishing - the list goes on! 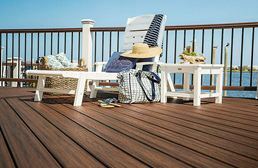 With composite wood decking, simply clean off your deck with soap and water when it gets dirty. The end. 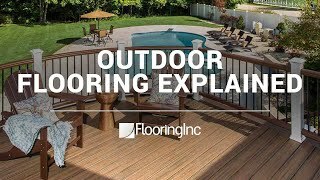 Quick and easy installation: Composite decking tiles and boards look and feel like real wood, but they don’t even need to be acclimated - you can start installing as soon you get them. Fire resistant: We all know wood burns, but composite floors are made to be fire resistant, keeping your floor and, most importantly, your family safe. The economically smart choice: Any research you do will tell you that composite decking is more expensive than wood. But when you look at the price of your deck over its lifespan, natural wood will end up costing you far more. Bug resistant: Need we say more? 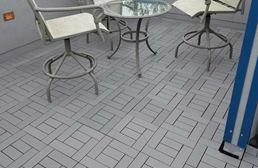 Composite deck tiles are by far the easiest flooring option to install in our selection of decking products. With easy snap-together interlocks, the tiles are easy enough for a child to install them...seriously! And doesn’t that sound like a fun family project? 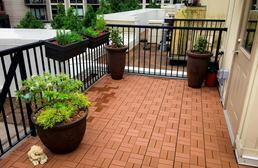 Composed of recycled plastic and bamboo, these plastic tiles are great as flooring for any outdoor deck, patio or even a balcony. Not every outdoor flooring option works or looks good on a smaller upstairs balcony. Composite deck tiles do! Not only are they good for outdoor spaces, but they can be installed indoors as well. 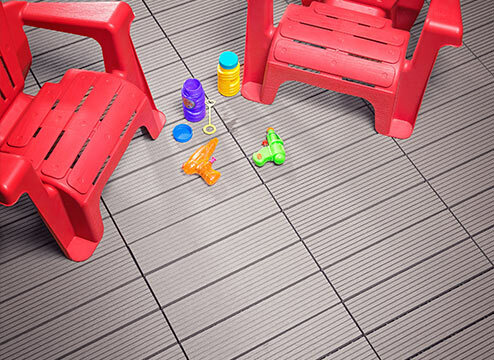 Our composite tiles feature several slatted designs and come in a multitude of colors, so you can literally deck out your sunroom with gorgeous flooring to match your style. Composite decking boards are lighter than wood and easy to transport, which can also make them easier to install. 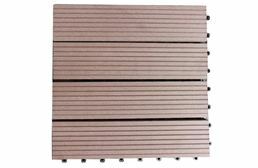 Tongue and groove composite decking boards easily click into place, diminishing any worries over when your spacing between boards is even. Deck boards can completely change up any outdoor space by adding some beauty and a feeling of luxury. 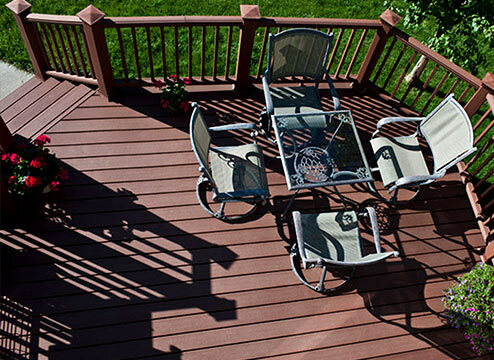 Durable and low-maintenance, the best composite decking boards come in a variety of colors. With these eco-friendly boards, you can find the exact look you’re going for without having to keep up with a traditional deck’s high-maintenance beauty routine. 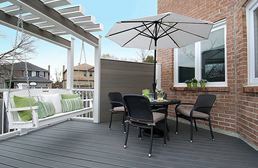 Composite decking gives you more options when choosing the look and feel of your deck or patio. Whether you hope to entertain guests or retreat to your deck as a quiet place, you can customize your deck to match your style. Get creative with colors and patterns to create your dream deck! One of the key perks of choosing composite over natural wood is the low maintenance required to keep its beautiful appearance. Plenty can go wrong with natural wood - yearly sealing treatment, termites, wood rot...no thank you! 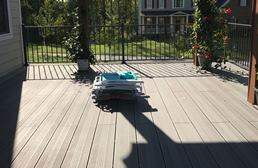 Composite wood decking tiles and boards are easy to clean and maintain. When your deck gets dirty, simply sweep up any loose crumbs, dust or debris, then hose it off or mop up stains with a mild soap-and-water mixture. Voila! Your summer deck doesn’t have to take the whole summer to build. Decks made from composite materials take hardly any time to install, and the tiles and boards are incredibly user-friendly. 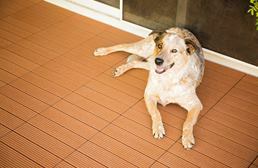 Starting with a clean subfloor, simply align the pegs of one tile with the holes of the adjacent tile and set them in! No struggle or elbow grease is needed for putting your new floor covering together. All that’s left to do is sit back on your favorite deck chair and relax! Everything you read will tell you that composite decking is more expensive than wood, but that just is not the case. Pressure-treated wood will run you $15-25 per square foot, while higher end woods will run $25+. 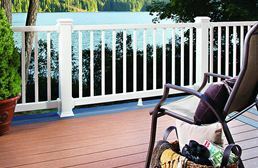 Our high-end composite decking runs $9-17 per square foot. Wood decking proves itself to be an incredibly spendy investment between materials, installation and just 2 years of treatments. All that’s left to do is sit back on your favorite deck chair and relax! Thickness 3/4" 3/4" 7/8" thick tile - .8" thick board 1" 1"